Over dinner a few with friends a few nights ago, we got to discussing seasons and food and somehow got into a debate about something that you may find kind of silly, but these are the things we do with good friends. The debate was about whether or not a season could have a flavor, to which most of us said, yes, absolutely, seasons could have a specific taste. Summer tastes like watermelon and lemonade. Spring tastes like mint and lamb. It went on for a bit, and even with these examples he was not convinced. After while, it dawned on me — he had grown up in Florida and parts of the Caribbean, and was only a recent transplant to the Midwest. So four distinct seasons is kind of a new concept to him. Needless to say, it was a long night. After that conversation, I got to thinking about fall, and the flavors of this season, that we are technically still in for another few weeks, even if it doesn’t always feel like it. What are the flavors that remind me of this season? And can I create a dish around all of those flavors without resorting to classic holiday dishes? Challenge accepted. I started with apples because apples are a classical fall flavor. And hearty vegetables. Nuts and cranberries, of course. Once I had a solid list of ingredients, I wanted it to be fall flavored, of course, but also different. So no slow cooker. How about something you can cook fairly quickly, in one skillet? And this dish was officially born. It starts with a little bacon and Ava Jane’s Kitchen Avocado Oil, and ends with eating a crunchy, sweet and savory, caramelized bowl of goodness tastes unequivocally like fall. 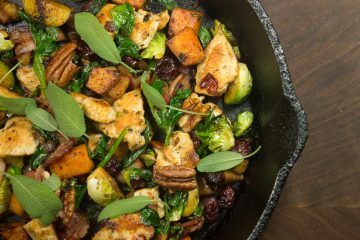 It’s also a meal that is loaded with veggies, high in protein, Paleo friendly, and would definitely work on a holiday — leave out the chicken and you’ve got the perfect side dish. Cook the bacon in a large heavy skillet until crisp. Remove with a slotted spoon and set aside. Add the chicken to the pan and cook until well browned. Remove and set aside. Add the oil, followed by the onion, apple, sweet potatoes, and Brussels sprouts. Cook until browned and caramelized and add the sage. Cook for another minute or two, until veggies are tender and add the spinach. Stir until wilted. Add the pecans and cranberries, and the bacon and chicken back to the pan. Stir until heated through. Season with Colima Sea Salt and fresh ground pepper, and add a few sage leaves if desired. Serve immediately. Hi Janet, sorry about the missing info! Yes, add 1 apple, any kind, cored and diced when working with the onion, sweet potatoes and brussels sprouts. Enjoy! Hi Sandra! Yes, add 1 apple, any kind, cored and diced when working with the onion, sweet potatoes and brussels sprouts. Enjoy! THIS IS SOMETHING I SIMPLY MUST TRY! THANKS FOR SHARING IT WITH US. You mentioned apples in the text but there is nothing about them in the recipe or the directions. What kind, how many? Sorry about the missing info Bev! Yes, add 1 apple, any kind, cored and diced when working with the onion, sweet potatoes and brussels sprouts. Enjoy! This recipe sounds good and I may try it. In Texas fall tastes like chili. We just made this for dinner (sans apples as our directions didn’t mention them). It was drier than a popcorn fart, and (I’m assuming), tasted about the same. Without a doubt, the most godawful recipe I’ve ever had. Who made this and then thought heck yeah, let’s publish this? Thanks for nothing. Hi Carey- Thanks for your feedback. I will pass long your feedback to our recipe writer. Hopefully you have checked some of our other recipes and found something more agreeable with your pallet. Have a wonderful holiday season! Do you only publish the favorable reviews? Hi Carey, Please see my response your previous comment.